The Civil War was the bloodiest cataclysm ever fought by this nation, and its impact continues to echo throughout the sports world — including the some of the aspects of sports that are routinely discussed here on Uni Watch. Sometimes that impact is overt, such as in the case of a Confederate flag patch worn on a baseball jersey. Other times it’s more subtle. For example, the Morill Act, which was signed during the war by President Lincoln — and whose passage was made possible by the secession of several Confederate states that had opposed it — created the land-grant system, which gave birth such popular NCAA schools as Cal, Michigan State, Illinois, Kansas State, and Wisconsin. We also see the Civil War’s impact in team nicknames. The most obvious case was the University of Mississippi Rebels’ mascot, “Colonel Reb.” This mascot was finally discarded after it was deemed too offensive, although the school still uses “Rebels” as a name. Despite a fine effort to make Admiral Akbar the new mascot, the school settled on a black bear wearing a grey wide-brimmed hat. Ole Miss also has the distinction of wearing an all-gray uniform against a navy blue-shirted Auburn team, echoing the Civil War’s military uniform colors. And of course there was also the now-discontinued Blue-Gray game. North Carolina also uses a nickname of Civil War origin, the Tar Heels. While Tar Heel has become a moniker for all North Carolinians, there are at least two stories about the term’s origin that come out of the war. The first was that as one of the last states to join the Confederacy, North Carolina was reluctant, or stuck, as though it had tar on its feet holding it in place. Another account records that Robert E. Lee remarked that North Carolina soldiers stood their ground so well it was as though they had tar on their heels. 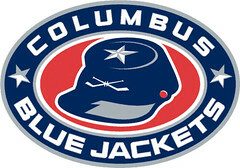 And there’s more: When the NHL looked to expand into Ohio, the league’s new Columbus franchise chose the name “Blue Jackets,” which symbolized the numerous regiments sent by Ohio to fight for the Union. The team wears a Union kepi as its shoulder patch and has a Civil War-era bronze canon as the crest on its alternate jersey. In another NHL example, the Calgary Flames started out in Atlanta. Their nickname and the red and gold color scheme were a reference to the burning of Atlanta after its capture by General William Tecumseh Sherman. The franchise kept its name after it moved to Calgary, so the team’s name refers to event that took place thousands of miles away from where it now plays (and ten years before the city of Calgary was even incorporated). OMFG: My latest One-Man Focus Group piece is about ticket stubs, and how changes in stub format may have big implications for the way people document their lives. Check it out here. PermaRec update: I have a bunch of new PermaRec items in the hopper, the first of which is about some amazing old papers, photos, and other documents that a Milwaukee woman found in the garage of a home she bought. Check that one out here. Show & Tell reminder: And in case you missed it yesterday, photos and stories from the latest installment of Show & Tell are now available on the S&T website. Uni Watch News Ticker: Giveaway of the year last night in Anaheim, as the Angels distributed these awesome Mike Trout caps (thanks, Phil). ”¦ The MLB All-Star Game BP jerseys are apparently made from a different fabric than regular MLB BP jerseys. ”¦ As several readers have noted, there’s been a bunch of uni-related chatter about whether Cap’n Crunch is really a cap’n. … Reprinted from yesterday’s comments: an article about NFL merchandising. … New NFL policy this year: Fans can only bring one clear, see-through bag to the game (from Tom Mulgrew). … Good piece by Todd Radom about the common historical link between the Yanks’ and Dodgers’ uniforms. … Each Brooklyn Cyclones jersey last night saluted a neighborhood that was hit hard by Sandy (from David Dyte). … Remember about a year ago when I wrote several times about those little paper football dolls called Cubees? Marc Parker has made over 100 of them since then. “I make them when I’m bored at work,” he says. … According to the podcast linked from this page, athletes exposed to the color pink just prior to an event tend to perform more poorly (from Ed Hughes). … I think we’ve covered this before, but just in case: Memphis is inviting fans to vote on new football uniforms (from Steven Knowlton). … The Jazz have a new video board. If you scroll down to the second photo, you’ll get a sneak peek at what appears to be their new court design (from Joshua Davidson). … LeBron James and Nike seem to be jumping the gun just a hair (from Kurt Esposito). … “I had never seen this version of the Cardinals logo character, called the ‘Bowing Bird,’ until this past weekend,” says James Poisso. “The plaque for the image read, ‘Bowing bird logo sign, ca. 1995. 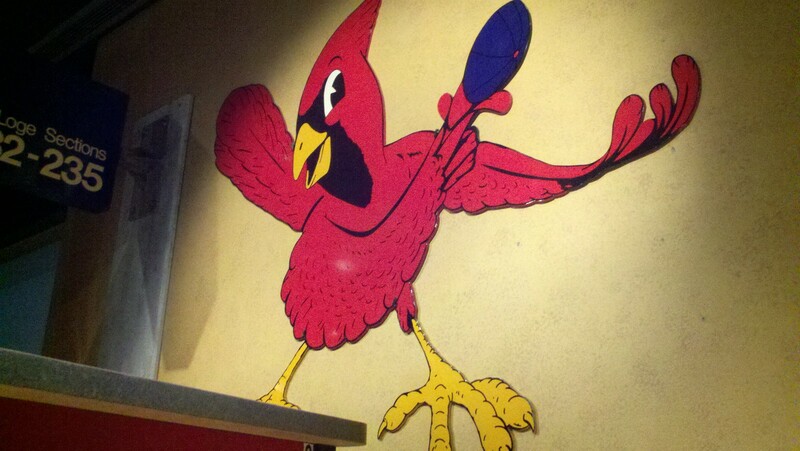 This metal logo, along with other images of the classic bird, could be found along the stairwells of Busch Stadium, placed there during the renovations in the ’90s. The origional bowing bird logo was first seen on a scorecard in 1954.” I confess that when I first read James’s note, I thought he said “bowling bird,” and then I was sort of disappointed to see I’d gotten that wrong. Anyway, I’ve never seen this version of the Cards’ character before. … A Giants ballboy was wearing a road jersey and home pants on Monday (from Andrew Greenblatt). … No photo, but Mets pitching coach Dan Warthen was wearing an orange undershirt last night, joining David Wright and Marlon Byrd in that regard. ”¦ More Mets news: Catcher Anthony Recker was wearing orange nail polish last night (from Nick LaRosa). ”¦ And yet another Mets item: Pitcher Zach Wheeler, who made his big league debut last night, had an odd pregame look, with his game jersey tucked into a pair of shorts (from Terence Kearns). ”¦ Check this out: The Red Sox have mowed their outfield grass in a Northwestern-striped pattern. Never seen that before (from Clint Richardson). ”¦ Looks like Melky Cabrera blued out the Franklin logo on his batting gloves last night (from Gabe Ortiz). ”¦ The old St. Louis Ambush logo has been updated for a new team (from Jonathan Karberg). ”¦ New currency signature for Treasury Secretary Jack Lew. ”¦ There’s a controversy brewing in Virginia over a proposed new logo for Prince William County (from David Cline). ”¦ I have to go see my Mom again today, so I’ll be off the grid. Play nice and I’ll see you tomorrow, okay? Okay. Now we know what color teams should paint the visitors locker room. Like U of Iowa did back thirty or so years ago. Last I heard, Iowa still has pink visitors locker rooms. Pink as a calming color is not a new thought. I can’t believe someone actually wrote a book about it. I hope the book’s author properly credited sources in his footnotes. Wheeler is wearing baseball pants rolled up and with his socks down, not shorts. Cap’n Crunch is a captain, you need to look at the rank structure for the period of uniform he is wearing. “Athletes exposed to pink perform more poorly.” So that explains why UConn’s kicker missed ALL FIVE field goals when wearing pink arm-sleeves, and any one of them would have won the game for us. Instead, we lost in OT, where he missed his fifth and final field goal. There are correctional facilities which have pink rooms to calm down unruly inmates/detainees. Iowa is one of several colleges to paint visiting locker rooms pink in order to take the aggression out of opponents. Paul, I thought it was “bowling” when I took the picture. Had to read the plaque twice to understand it was just “bowing”. I’m afraid Jeuttner got it wrong on the history of the Tar Heel nickname. It actually dates back to pre-Revolutionary times, and was an insult. Stuck between relatively prosperous Virginia and South Carolina, North Carolina was poor, and its primary industry was naval stores–pitch and tar from the plentiful pine trees down east. People from NC were said to be so poor and ignorant they walked around barefoot, with tar on their heels. The state and UNC have sanitized the story over the years (see the absolutely untrue origin stories above) and do wear the nickname with pride. But its got nothing to do with the Civil War. And let’s not forget that the Jayhawkers and Tigers have origins that date back long before either school used them as mascots. Both terms were originally used in reference to military regiments that roamed the Kansas-Missouri border during and after the civil war. Now your Mizzou link is bad. You forgot Georgetown, their blue and gray colors pay homage to both sides who fought in the civil war, it is especially fitting because DC was right in the middle of the two sides. THAT is a cool fact. I never knew this either; this is great! David Dyte makes Cubees when he’s bored at work. When I’m bored at work I log into Uni-Watch.com! Hey-Ooooo!!! Is this notable because he’s wearing polish, or because it’s orange polish? Probably the fact that it’s orange. White and chartreuse can both be seen on a fairly regular basis. AJ Pierzynski wore yellow nail polish the other night against the Jays, in Texas. This is a product you will see the MLB and NCAA catchers wearing all the time called “Game Signs” They are reflective stickers placed on the catchers nails to highlight the signs. It works better and is easier to use than paint and tape. Indianapolis’ new NASL Soccer Team the Indy Eleven was named such for a variety of reasons, but perhaps the primary reason (or at least the reason that got the ball rolling) was naming them after the Indiana 11th Regiment Volunteers who were lead by Lew Wallace, author of Ben Hur. Sorry forgot to mention the 11th were a Civil War unit. I did a little research a few months ago on pro sports teams named after military personnel, and the argument can be made for only 2 such teams: Blue Jackets and Patriots. 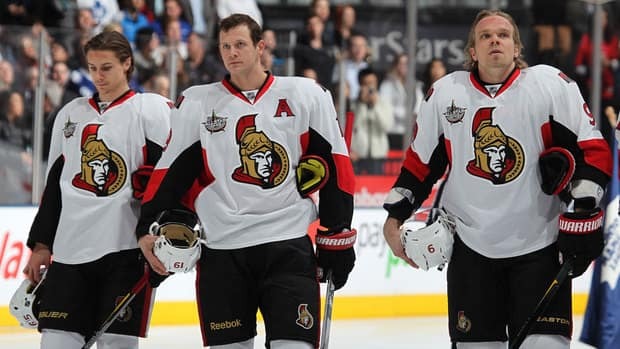 While the team name doesn’t necessarily reflect military personnel, the Ottawa Senators logo clearly does. Sorry, I should have clarified that I meant only American military (given how deeply entrenched in military our history is). Broaden the parameters a little and the Winnipeg Jets could be included, as well as the Chicago Blackhawks depending on which origin story you go with. Also, acase could be made for; Buccaneers, Raiders, Cavaliers, Warriors and (depending on their application) Rockets. No. The Texas team is named after law enforcement, not the military. The Manhattan club was a play on the nickname of the original owner of the team, George Lewis Rickard. When your nickname is “Tex”, “Tex’s Rangers” just flows naturally. Winnipeg took the Jets name originally because Winnipeg hosted an international airport. The WHL team formed in the late 1960’s when commercial air travel was still a big deal. There was some derision when the Zombie Thrashers announced their branding because it introduced military overtones that really were not true to the team’s roots. “Rockets” had little tangible application for the San Diego NBA team. The name piggybacked off the slogan of “a city in motion.” While it fits like a glove for Houston, that application is not military related either. Eisenhower explicitly pushed NASA as a civilian service. Here’s the writeup I did about it (hopefully it will explain my thinking). But I’m loving this conversation as a whole. Things I hadn’t thought of. That’s a good one. I left out Doubleday because in this case I wanted to focus on uniforms and nicknames. The Civil War’s relationship to baseball is huge. When A. G. Spaulding was looking for an inventor of baseball, Doubleday’s war background made him a perfect candidate. Beyond the creation of that fiction the war itself helped spread the game around the country as troops from the Northeast were put into close contact with Southern and Midwestern troops either in the field or in POW camps. When those men went home they brought the game back with them. “Baseball in the Garden of Eden” by John Thorn fleshes out the creation myth immensely. Probably the most in depth research into how the story cam about. As well as being a war hero, Doubleday had connections to a religious group Spaulding was also a part of. Makes me wonder about teams named after individuals. Other than the Doubledays, the only instance I can think of would be the Blackhawks, being named after a military unit which was in turn named after Chief Black Hawk. Cleveland Browns are the main one that comes to my mind. And if you believe the rumors and speculation, the Charlotte Bobcats as well. I’d forgotten about the Browns. Good one. A few more Civil War notes: Wisconsin’s Camp Randall Stadium stands on the site of a former Union Army training base (Camp Randall, naturally); and “On Wisconsin” takes its title from the rallying cry used by Union officer Arthur MacArthur (father of Douglas) at the Battle of Missionary Ridge. Staying in the Big Ten – the Michigan “wolverines” moniker predates the Civil War but became a part of the state’s DNA when Genereal George Armstrong Custer rallied the Michigan Brigade on the right flank of Gettysburg with the cry, “COME ON, YOU WOLVERINES!” Needless to say, the flank was protected, the battle was won, and the tide of the war turned in the East. Props to Thos Juettner for his survey. Good stuff. Very interesting (to me) that, until the Bluejackets, Confederacy-inspired nicknames way overshadowed Union analogues. As a Thaddeus Stevens fan, I hate those Reb names and am glad to see them dwindle. Andy White’s version of Tarheel provenance is what I was taught. Ditto Colin re Georgetown. Not a single mention of Lebron going headbandless in last nights game? The real question is what does he do in Game 7? I’m an amateur Civil War historian, so this is definitely a fun topic for me. I can think of at least one addition to today’s article. Louisiana’s troops during the war eventually came to be known as the “Louisiana Tigers”, so it reasons to stand that that’s at least part of the reason why LSU adopted the nickname. LSU’s nickname, the Tigers, has Civil War origins. Certain infantry troops called the Louisiana Tigers made a reputation for being tough fighters. The troops were mostly immigrants and some wore striped pants. Also, General Sherman was (briefly) the first president of the military institution that would become Louisiana State University. After the war, Sherman donated two captured Confederate cannons that were used to fire on Fort Sumter to LSU. The cannons are currently displayed in front of the Military Sciences building, not far from Tiger Stadium. Today’s Potomac Nationals of the Carolina League used to be the Potomac Cannons, nee the Prince William Cannons, and while no time period was ever specified, the team name pretty clearly drew on the abundance of local Civil War battle sites, especially Manassas/Bull Run. In Missouri, one local home guard, formed to defend citizens from partisans of both flags, was called the Tigers. I’d always heard that the original Missouri Tigers home guard was a Union-leaning outfit that was formed to protect Columbia from infamous Confederate bushwhacker “Bloody Bill” Anderson. Stories of the nickname’s origin from the University of Missouri’s official athletics site site and the Missouri Civil War Museum seem to support this as well. If you found some sources that paint a broader portrait of the original Missouri Tigers’ mission, I’d be interested to see it. It wouldn’t surprise me if the university was choosing to emphasize its namesake’s alignment with the “winning side” (and deemphasize any antagonism toward it) for any number of politically and culturally expedient reasons. But if the true history is more complex than the official version of the story, not much seems to have been written to bring it to light. By the way, really interesting stuff today, Paul. I thorougly enjoyed reading it. WOW Memphis is finally getting new football uniforms. Finally. I like the tiger stripes. wish they kept all 4 pairs of pants though. wonder if they get new helmets? That’s still an official logo despite the retro uniforms. How many other cases of essentially using two distinct primary logos are there in American pro sports? The Jazz seem to be using two different identities simultaneously. Had the newly relocated Houston Oilers listened to a small and vocal band of Tennesseans they might have been renamed the Copperheads. While the name probably was in reference to the venomous snake, it could have been (mis? )interpreted as a reference to nickname Lincoln gave to the small and vocal band of ‘PeaceDemocrats’ who opposed the Civil War. There is another story behind the Tar Heel nickname for all North Carolinians. During the colonial period, and up into and past the Civil War, North Carolina produced more pitch and tar than any other state. The coast was one of the biggest producers of ships made in the colonies. This was because of the great access to the ingredients for pitch and tar. They story goes that the workers of NC worked with tar so much that they were always walking around with tar on their feet/heels. Thus, the Tar Heel nickname came to be. The Memphis uniform vote is odd…the only difference between the two options is blue or grey pants (guess that fits with the Civil War theme of today)…what really bugs me is that the font is different on the BFBS jersey. There are several stories about the origin of the Tar Heel name. A lot of the other stories are apocryphal and could still certainly be true however according to the UNC libraries, the earliest definitive use of the nickname was from the Civil War era. Good piece on the Civil War today. I’m surprised that there was no mention on how baseball caps were partially inspired by the hats worn by soldiers in the Civil War. (Many of the earliest baseball players were Civil War veterans.) The 150th anniversary of the Battle of Gettysburg is in a couple of weeks, I’ll be down in Gettysburg for the festivities. 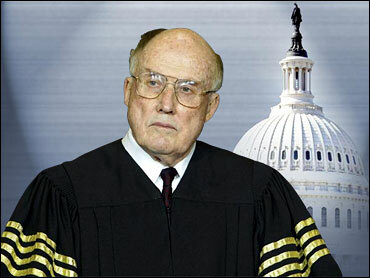 With that said, I do have a question on the NFL requiring clear bags: what about the women who need to bring tampons in? (Coincidentally enough, another invention of the Civil War, though not originally invented for what they are used now.) This is a rule that largely doesn’t affect guys, but a lot of women do want to keep possession of tampons private from the general public. no need for a bag–clear or otherwise. Re: The Bowing Bird Cardinals logo. It’s true that the Bowing Bird logo first appeared on the cover of the scorecards sold at Sportsman’s Park in 1954 (I remember seeing one that my Mom had when she and her family went to a game against the Cubs)> The marketing slogan attached to it was “Let’s Go See the Cardinals!” I remember that the cover was the bird on a bat handle with a baseball on a green background. Hope that helps–thanks! Tom Hamilton, the Indians’ radio announcer actually made a couple of comments about it at the start of the broadcast, noting that it was almost never seen on the field anymore and he actually used the term “sanitary socks” correctly. Also not uni-related. Though his outfits were awesome. I used to love drawing that St. Louis Ambush logo over and over again back when I was in grade school when the original team was around. I think I was fascinated by the fact that the ‘b’ doubled as a cannon. It was always my understanding that, under naval tradition, the commander of a ship was referred to as Captain, regardless of actual rank. If Commander Jones or Lieutenant Commander Jones has command of a ship, while in command they’re properly referred to as Captain Jones. Looks like the Utah Jazz are getting a new court from the one of the pictures. A few teams, including the Caps and Nats here in DC, have switched to a season ticket holder card instead of printing out sets of tickets. When you get to the entrance, you swipe your card and get a generic print-out showing where your seats are. No photo or artwork. 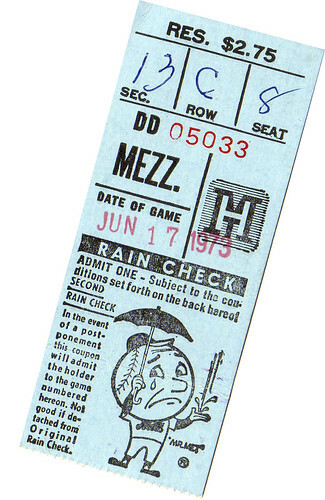 Even the old computer printout tickets were a little more interesting than these. I seem to remember reading somewhere about the Winnipeg Jets offering to send actual tickets for an extra $60 fee and that the Nats would offer actual tickets for sale at their team store. I think I remember from a long-ago, highly joke-y Twitter conversation, that the Nats offer season tix holders paper tickets for like a $1 surcharge per ticket. At the team store, you can buy expensive commemorative prints of tickets. I have Nats season tickets and you get a separate card for each seat (can also get cards for individuals who purchase as a group). You are is loaded with your tickets and you just stick it under the reader and, voila, you’re in. Each card has the individuals name and the corresponding sec, row and seat number so it works as a ticket once you get to the usher. I believe the Nats are the only MLB team currently using this system. Haven’t used it yet but, it also includes Nats Bucks where you can put cash on the card to use inside the stadium. You can also order (for a small fee, of course) actual tickets for the games attended. Haven’t been to a Caps/Wizards game in awhile, not sure how they’re system works. I do know it differs from the Nats though. The New York Red Bulls of MLS use this system, including the cash-for-the-concession-stand part. Just one more reason to stay at home and watch on TV. If I don’t have a ticket stub to commemorate the occasion and to have to put in my “ticket stub binder” what’s the point of even going? I mean besides the over-priced concessions, the exorrbinate parking fees and the drunk behind me dropping mustard down my back. Oh that’s right, the experience. As the senior officer aboard the USS Crunchberry, doesn’t that make Officer Crunch the right to be called Captain? Shouldn’t he really be Skip’r Crunch, then? Or, since he actually commands a fleet of cereals, including Crunch, Crunchberry, and Peanut Butter Crunch, Commod’r Crunch? By this point, he should probably be an Admiral, but, much like James Kirk, he’s too stubborn for his own good and insists on having his own ship. So he’ll always be a Captain, at least until he gets killed by a bad plot device. Don’t Admirals get their choice of ship? For example, Riker in the future timeline of All Good Things? I hadn’t seen yours when I put mine up. The perils of typing and not hitting ENTER until much later! I’m agreeing with you. One guy with a theory is just a crank, the fact that TWO of us said it makes it true. Or maybe, like a certain prominent American figure of the recent past, Captain Crunch has just seen too many Gilbert and Sullivan operas and randomly decided to sew stripes on his everyday clothing? …it’s so weird that teams pick random colors for these 3rd jerseys, though. I’d never seen it before*. It’s really nice. * — it helps that I haven’t watched a single game since the lockout, of course. Another Civil War related aspect of athletic aesthetics is the use of Rebel as a mascot for a team in a southern portion of a region that wasn’t heavily involved in the war itself such as grey-clad UNLV (olim. University of Nevada Southern Division), Denver South HS, Columbine HS (at the time of its opening it was the southernmost HS in its county and in Metro Denver area; it also included grey in its colors). RIP Dave Jennings, former NY Giants punter. Paul, I know you’re a fan. I guess you all have seen this: NBA To further audition short-sleeved shirts. Up to five teams may add short-sleeved alt (even though apparently all were offered to do it, only five have taken them up on it.) As long as it helps them move some merchandise. Missed your post, hence the repeat post below. I think the merchandise aspect of this isn’t particularly noteworthy. NBA teams modify or release new or alternate uniforms all the time to get fans to buy them. What I think is noteworthy is the fact that, with all of that “empty” space on the sleeves, this could be where the uniform ads end up. Sure, it’ll be six teams next year wearing these alternates, but what’s to say we won’t see every team in the league wearing ad-adorned sleeved unis in a few years? New shoes for Nebraska football. ESPN article that confirms more NBA teams wearing short-sleeved alternate uniforms next year. The article includes a statement by a league official recognizing that more adult men are likely to buy/wear something that resembles a T-shirt than something that resembles a tank top. Is this a bad thing? I say no, can’t change history. Lately after reading about the drama on this site with nicknames in todays sports teams being offensive to whoever has become a yawner.., but isn’t an impact of yesterday’s world worth noting in the common era of sports? So many man made laws and rules nowadays just for the reason of cause. Can someone explain to me why no teams in Atlanta are called the Phoenix? The last bit in today’s entry highlights the how relevant it would be to the city (hell the region). Not only did the city of Atlanta rise from the ashes of Sherman’s march the entire south eventually did. Which is one reason why I scoff at those who find the phrase “the south shall rise again” as offensive. Reality is, the south was devastated by the loss in more ways than one and if Andrew Jackson had not stepped in it would have been much worse (they even tried to impeach him because he refused to allow the crippling sanctions the north wanted to place on the south to go through, without him the nation would have never recovered). Anyways I will make every effort to get our impending MLS team to be named the Phoenix, and if I’m ever rich enough I will by a Hockey team move them to the ATL and call them the Phoenix. That about sums up the good and bad about the world in which we live today.